Middle East Respiratory Syndrome (MERS): Who is at risk? Whether you’re a health professional, a regular traveller to the Middle East, or you're planning to visit the region for Hajj and Umrah, you may have heard of Middle East Respiratory Syndrome, or "MERS". The risk of contracting the virus remains very low but simple precautions can help visitors stay safe. PHE's Dr Richard Pebody answers some key questions about the virus and PHE's work to tackle it. Middle East Respiratory Syndrome Coronavirus, usually shortened to MERS or MERS CoV, is a respiratory virus first identified in 2012 in a patient in Saudi Arabia. Public Health England played crucial role in the discovery of this new virus, diagnosing one of the first cases in the world at our laboratories in Colindale in September 2012, a patient from the Middle East. It was dubbed Middle East Respiratory Syndrome because of the origin of the first cases. Corona is the Latin word for crown or halo, and corona viruses are so named because the surface protein spikes of the virus resemble the ‘corona’ or halo of the sun. Technically MERS is the syndrome caused by the MERS virus, while MERS CoV would refer specifically to the virus itself, but both terms tend to be used interchangeably. So MERS cases occur mainly in the Middle East? Following its identification in 2012, cases have continued to occur primarily within Kingdom of Saudi Arabia and the United Arab Emirates, with 97% of cases reported from the Middle East. Cases associated with travel to the Middle East have also been seen in several European countries (including Austria, France, Germany, Netherlands, Italy, UK, Greece) as well as other parts of the Middle East (Egypt, Iran, Jordan, Qatar, Kuwait Turkey and Oman) and the rest of the world (USA, Malaysia, Philippines, Algeria, Tunisia). In France, Tunisia and the UK, there has been limited, non-sustained transmission among patients who had not been to the Middle East, but had been in close contact with imported cases. Most recently we’ve seen cases of MERS in South Korea and China, with secondary cases in health care settings linked to a person with a recent history of travel to the Middle East. How has the UK helped with diagnosing cases? Public Health England lab staff have developed a series of tools for diagnosis and surveillance of MERS-CoV, giving other scientists the ability to generate genomic sequences and measure antibody responses. These tools are not only deployed in the UK, but can also support international investigations and responses within affected countries. In October 2012 we provided virological and epidemiological support to a WHO led mission to Doha, Qatar and we continue to provide virological and diagnostic support to Qatar, most recently in December 2013 when PHE ran a training course to enable Qatari scientists to undertake MERS-CoV testing. PHE also provides guidance to doctors on identifying and managing cases of MERS-CoV, as early identification and implementation of prompt infection control precautions are very important to limit onward transmission. Are we at risk in the UK? The risk of contracting infection in the UK remains very low. Two imported cases have been diagnosed in the UK who had both returned from travel to the Middle East (the first in September 2012 and the second in February 2013). There was very limited onward transmission with two secondary cases, both close family members, linked to the second case. Although cases continue to be reported from the Middle East, no new confirmed imported or secondary cases of MERS-CoV have been detected in the UK since February 2013. What if passengers travel on a flight and sit near someone with MERS? The risk to airline passengers remains very low, but in the event of a case involving contact with UK passengers, Public Health England would consider undertaking contact tracing, where we work with airlines to follow-up any passengers who might have been in contact and provide health information and reassurance. In April 2014, PHE was advised of 2 cases of MERS-CoV in passengers flying from Saudi Arabia to the US and transiting through London Heathrow. Although the risk of the infection being passed to other passengers on the aircraft was extremely low, as a precautionary measure we undertook efforts to contact UK passengers who were sitting in the vicinity of the cases. There was no evidence of any onward transmission to the other passengers, and the experiences gained have informed planning for future events. What precautions should Middle East travellers take? We advise travellers, particularly those with underlying or chronic medical conditions, to avoid contact with camels in the Middle East and practice good hand and respiratory hygiene to reduce the risk of respiratory illnesses. Travel advice is available from the NaTHNaC website. The risk to UK residents travelling to Middle Eastern countries may be slightly higher than within the UK, but is still considered very low. What about the current outbreak in South Korea? Public Health England is closely monitoring the MERS outbreak in South Korea. The outbreak is linked to an individual with a history of travel to the Middle East, and subsequent transmission has taken place in healthcare settings. The risk to UK tourists visiting South Korea is considered very low at this time. Why do you recommend avoiding contact with camels? There is growing evidence that the dromedary camel is a host species for the MERS-CoV and that camels play an important role in the transmission to humans, however the source of infection and transmission modes of MERS-CoV are still not completely understood. There is still more work needed to understand the role that camels play in the spread of infection, but until more is known we recommend avoiding contact with camels in the Middle East. Could we see more MERS cases in the UK? The risk to UK travellers to the Middle East remains very low, and although MERS infection has been ongoing since it was identified in 2012, the UK has still only seen 4 cases. As we do with all infections, Public Health England continues to provide advice on infection control, urgent diagnostic investigation and identification of contacts of suspected cases in England who may need to be followed up to check on their health. We also advise healthcare professionals to remain vigilant for severe unexplained respiratory illness occurring in anyone who has recently travelled in the Middle East, as well as any unexplained cluster of severe respiratory illness or healthcare worker with unexplained severe respiratory illness. Where can professionals read more on MERS? PHE has published a range of clinical documents and our scientists recently published a paper in Eurosurveillance about our response to the two cases involving passengers with MERS transiting via Heathrow. 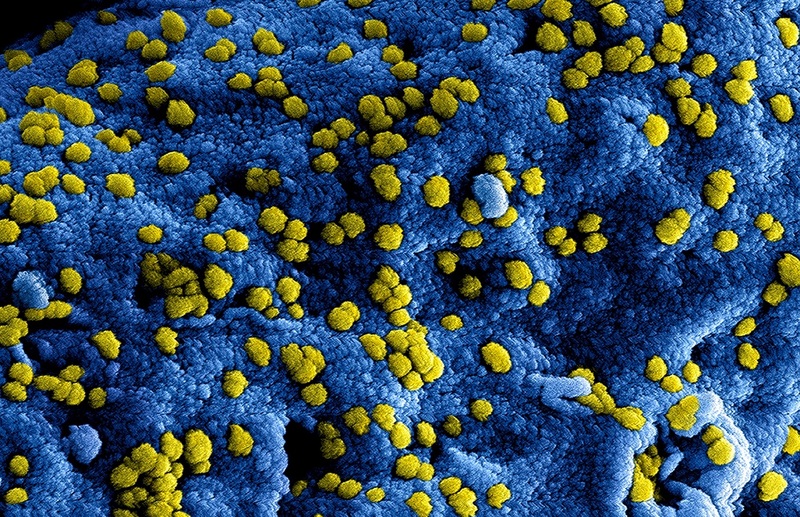 IMAGE: National Institute of Allergy and Infectious Diseases (NIAID) - yellow-coloured Middle East respiratory syndrome Coronavirus (MERS-CoV) viral particles on the surface of a Vero E6 cell, colourised blue.